In a class all of its own in the supersport world, Honda’s CBR500 RA bridges the gap between the gaggle of bikes gathering loosely around 300cc and 600cc capacity marks. It also fills a gap in the market price wise, and this may be where Honda have pulled a very smart move. The Honda’s two-grand premium over a Yamaha R3 or KTM RC390 may seem a little steep for a mere extra 150cc and 98cc respectively, but I think the buyer who gravitates toward the CBR will already have prepared their justification for a higher budget. To me, the CBR seems to be the bike here most likely to be bought as a long-term keeper, rather than just something to ride out your learner licence restrictions on. I can also see it being purchased by riders already on an unrestricted licence, far more so than with any of the other bikes on test. It’s fair to say the larger-capacity lower-revving Honda should represent a less stressed and therefore longer lasting engine. So with this in mind – and Honda’s bulletproof reputation for this type of half-litre workhorse engine – it’s a good option if you’re looking for long service. 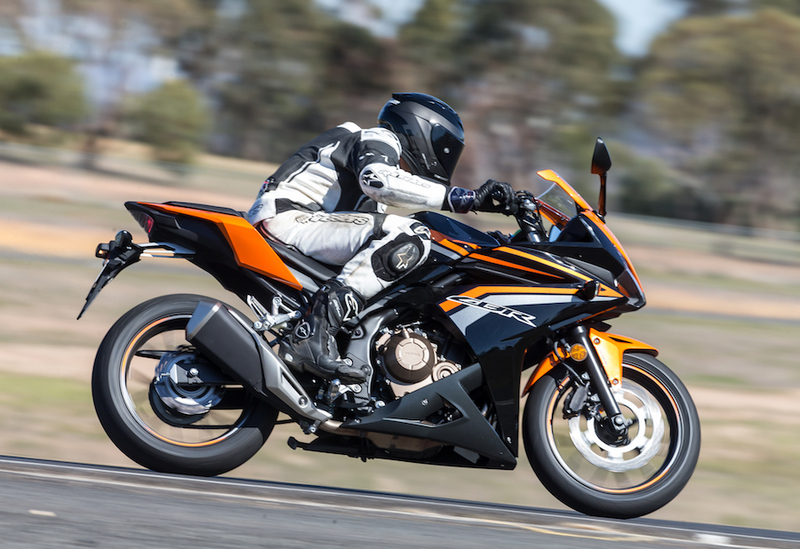 You also get a little more power, a lot more torque, and between 20-50kg more weight with the CBR. Overall it has less sporting attitude than the other pocket rockets. The feeling is sports touring rather than supersport, due to a more upright riding position, and the engine’s Captain Sensible characteristics. But when it looks as sharp as this latest model does in the flesh, who cares whether it’s not as authentically uncomfortable as a ‘real’ repli-racer? The more I rode the CBR the more I appreciated the difference it brought to this test. We all agreed it was the bike we’d prefer to be on towards the end of a long day of riding. It’s also the best equipped for taking a pillion. With today’s throwaway society, I love seeing bikes that are made to last and also made to be more easily repairable. The Honda is the only one with a bolt on subframe. Tick! And just to show off its full-sized bike credentials, it has wider wheels than the others, and storage under the seat big enough for a set of waterproofs. Look closer and you’ll find details that set the Honda apart. A floating front petal disc and adjustable brake lever, classy looking aluminium number plate bracket, bigger rubber … But what you are really paying extra for is those scant few extra cubes. And with most Japanese-made 650cc LAMS bikes up around the 10 grand mark now, $8K seems like a fair price for a high quality 500. The Honda wasn’t totally beyond criticism. Lacking a gear position indicator on the dash and a rear end that one of our larger riders described as a bit “marshmallowy” when pushed hard. I’d say if they’re the worst of your problems, you’re not doing very bad at all. You can tell the CBR500R uses a modular platform shared with the CB500X and CB500F – it feels more like a sports tourer than a sportsbike. Quality and finish? It’s a Honda! It’s $2000 more than the Yamaha, however, you could keep riding the CB500R long after you obtain your full licence and probably never get tired of it. I have owned a few Hondas and there is definitely something about them that feels like home for me – they’re instantly comfortable. But for this test the CBR is more touring than sporty. Good value for money, great quality finish and nice smooth performance. For rideability on road and around town this bike has the others beat. It has the best front end of the bunch and eye-catching paintwork that was hard to fault. 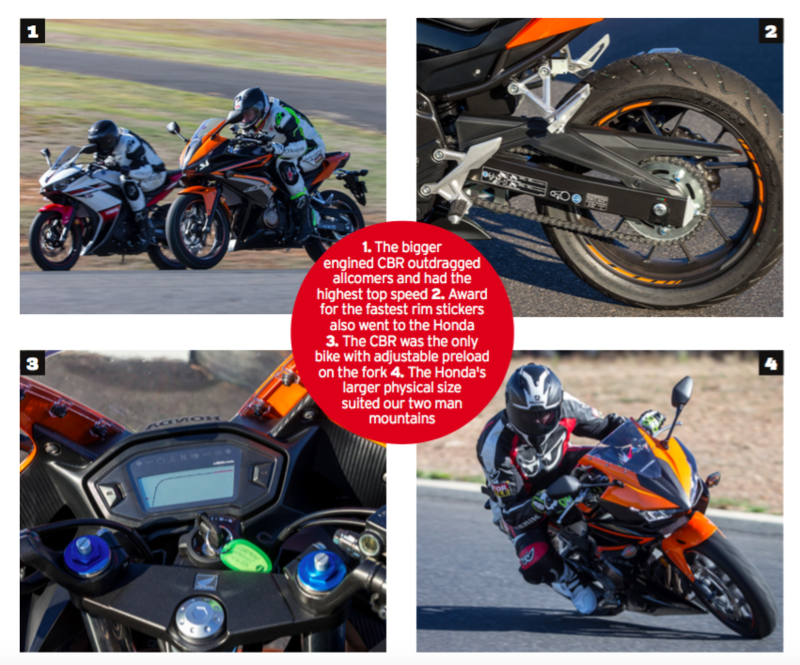 With the extra capacity the CBR surely has some additional appeal and would keep more learners happy for longer. Nice and clean styling with good quality components – typically Honda. At around $8K it’s definitely a bike that you would expect to hold its value better than the lower-priced competitors. Honda’s reputation for reliability is reassuring. Because of the extra weight and slightly more upright seating position, the CBR feels very reassuring, and is easy to ride from the get-go. While the handling is good, it’s perhaps not as sharp as you’d expect from a sportsbike. It’s a winner in the looks department – schmick finish and that high-contrast black and orange colour scheme.